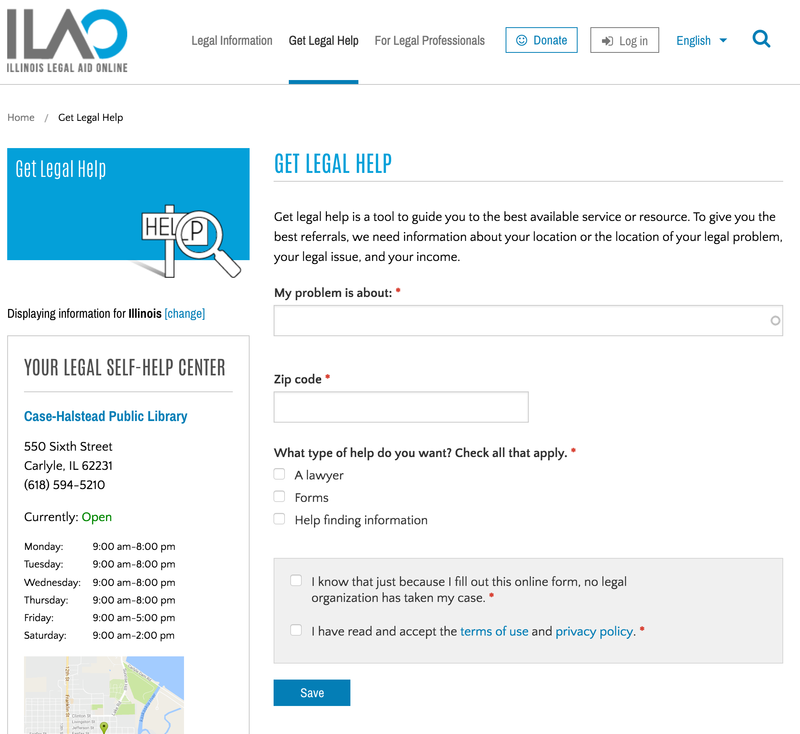 Illinois Legal Aid Online, or ILAO, just completed a major overhaul of its online platform — consolidating four separate websites — including IllinoisLegalAdvocate.org, IllinoisProBono.org, and IllinoisLegalAidOnline.org — into one mobile-friendly site: IllinoisLegalAid.org. I’m pleased to share our launch on the Open Referral blog, as the data model produced by this community has enabled us to increase the complexity of our information while simplifying the experience for our users. Across our pre-existing sites, our ‘helpful legal organization’ referrals have long been one of our most popular features. We serve up profiles for more than 50 legal service providers across Illinois to people looking for legal advice and representation. Information about organizations — such as the services they provide, the geographic area they serve, their capacity and eligibility criteria. One key element in this process was the adoption of Open Referral’s data model — the Human Services Data Specification — for describing Illinois’ myriad of legal service providers in a consistent, interoperable way. Our previous system was rigid in ways that limited our ability to organize and share complex information. 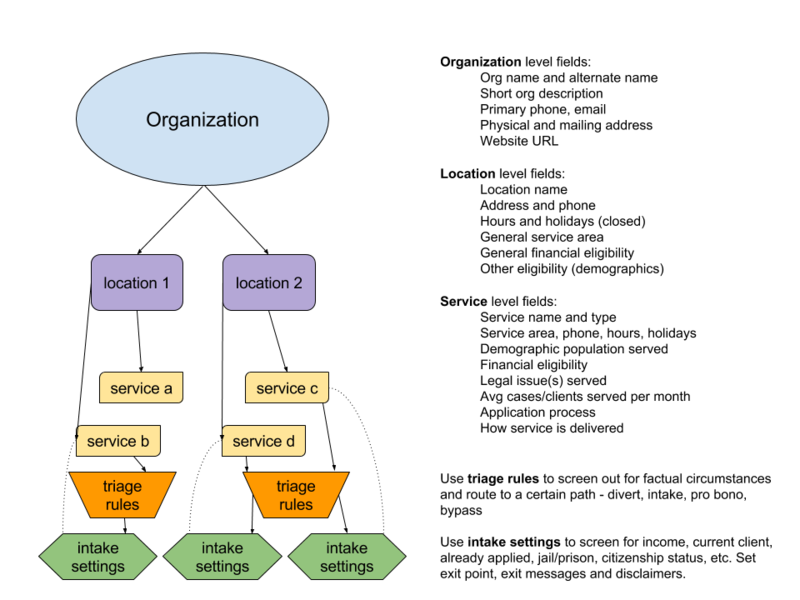 The database structure was so rigid that it hindered us from effectively describing services offered by organizations that had more than one office. Instead, our system expected every office to be associated with its own organization. We ended up figuring out how to hack these separate records together on the back end for reporting — but it wasn’t a good solution. For example: Prairie State Legal Services has eleven offices, serving counties in northern and central Illinois (outside of Cook County). We had eleven separate organizational profiles for Prairie State. Likewise CARPLS — which provides coordinated legal advice and referrals for Chicago area residents — has both a hotline and courthouse help-desks specific to court calls, such as post-judgment collections, municipal and domestic relations. Although these walk-in services were provided by the same organization, we had to structure their information as separate organizations. This was the first big problem that Open Referral solved for us: a way to effectively represent organizations that have multiple locations. Furthermore, Open Referral helped us represent when multiple services were offered at a single location. So one courthouse could have many different help-desks and other services. These may sound like boring implementation details, but it has made a big difference in the ways we are able to help users find the help they need. It helped us in other ways, too. For example, on our old website, we created a triage and intake system — through which website users could answer questions to identify whether their legal problem would qualify for free legal help. Making this system work with our rigid ‘helpful organizations’ directory database was a major challenge. We basically had to hack this on top of that, in an ad hoc way that mostly worked but gave me a headache whenever I thought about it too long. Using Open Referral, we are now able to fully integrate an organization’s intake and triage tool with its broader services profiles in a triangular way — so that the information modules can refer to each other without having to be structured on top of each other. The granularity of the model also helps us indicate which services are accessible via online intake, and which are not. (The old interface would simply offer users who were screened out of the triage and intake service a ‘ sorry’ message and some self-help tools.) Our service information is more complex now, so that we can indicate ‘this service is specific to seniors’ — or even more — ‘this service is for seniors who are on Medicaid.’ This enables our triage system to be more precise in its screening. On the intake side, we can now tailor our rules which determine eligibility for a program — like what expenses can and can’t be counted against an income calculation, for example — at an individual service level. This approach does create new challenges: data entry, for example, can be much more onerous when dealing with serialized information. We used to be able to change program information with a global setting. But now there’s so much granularity possible that being able to change something in one place and have it be reflected in another place is tricky. Yet we believe this is a solvable challenge. We’ve already designed our data entry system to prompt the administrator to confirm whether or not the piece of information is the same as the other services and/or locations — and we expect more tools to emerge that make this a more efficient process. We’re still updating and adding to the new IllinoisLegalAid.org, and we’re also looking ahead to an exciting future beyond a website or portal. Coming up on our roadmap is the development of widgets for our partner’s sites to enable their users to screen for location and issue eligibility in our database, without having to jump between websites. A fifth website, AyudaLegalIL.org, which serves Spanish speakers facing legal problems, will also join the list of sites consolidated into IllinoisLegalAid.org by early 2017. The addition of other languages will present its own challenges but will also expand the number of people we are able to serve. Knowing that a person with legal issues is rarely just facing a legal issue (they also have a financial problem or a health problem or a family issue, etc. 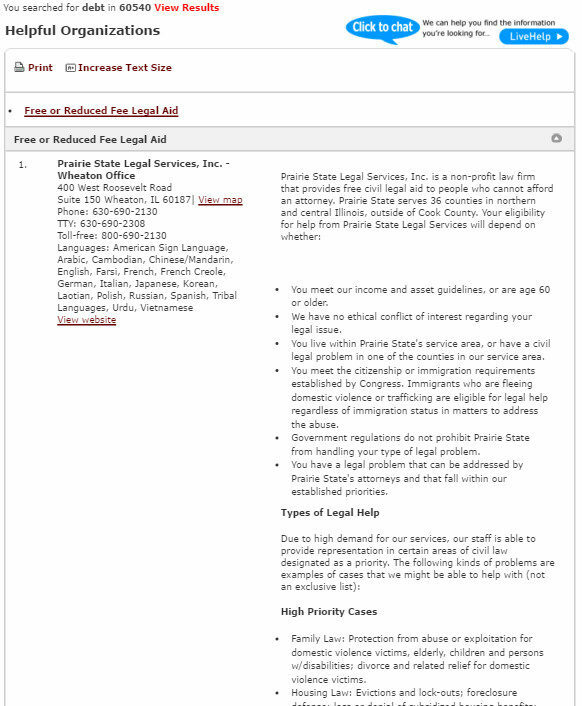 ), we also hope to someday offer IllinoisLegalAid.org users the option of social service and medical/health referrals. Think of the benefits to our users if we were able to give them a comprehensive set of referrals, rather than one just limited to the legal area. This is another reason why we support the Open Referral initiative: as organizations like Purple Binder and 2-1-1 providers adopt this standardized format, we move much closer to a future in which people can readily access not only justice but assistance with health and many other kinds of security. We welcome ideas from the Open Referral community for how we might serve our community in even more effective ways. Blog chicago, implementations, legal services. permalink. Site looks good. Who is maintaining the content and ensuring that it is current? Cat, thanks for your comment and question. ILAO helps to maintain the content, but our staff works closely with the legal aid organizations throughout Illinois in training and supporting organization staff on contributing to and managing their organization presence on IllinoisLegalAid.org. We expect maintenance of the data to be the trickiest part of this implementation. Thanks Teri for your thoughtful and detailed post. We all know what you mean by, “gave me a headache whenever I thought about it too long.” We applaud your purpose and commitment to improving the delivery of social services. Thanks so much, David. Of course, many things give me a headache when I think about them too long, including budgets and fundraising.